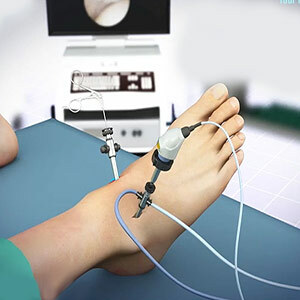 The larger image on the television monitor allows the surgeon to visualise the joint directly to determine the extent of damage so that it can be surgically treated. Surgical instruments will be inserted through the other tiny incisions to assess and treat the problem. After the procedure, you will be taken to a recovery room. The ankle joint will be immobilised with a splint or cast. The nature and duration of immobilisation will depend on the type of repair performed and the preference of the surgeon. The surgical site should be kept clean and dry during the healing process. Patients may be prescribed pain medication for the management of pain. Elevation of the ankle and ice application helps to reduce pain and swelling. Follow your post-operative instructions for the best outcome.